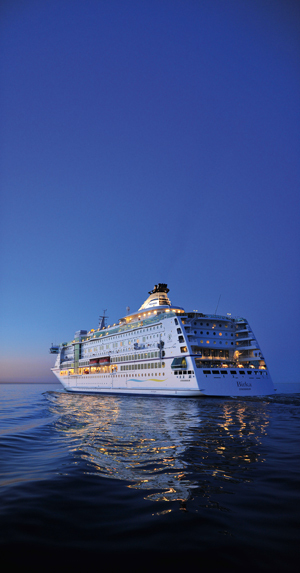 Rederi AB Eckerö wanted to increase the safety and the communication onboard their flagship cruise liner M/S Birka. Their choice fell on the newly developed SMART1 communication system from COBS. With the help from Zenitel, who are specialized in critical communication within the marine sector, the ship now has a future-proof, wireless alarm and telephony platform. Onboard a cruise ship is of course availability, security and flexibility important factors for maintaining the safety for all passengers and crew. A cruise liner like M/S Birka is like a hotel, several bars, nightclubs and a small retail chain at the same time. Even machinery and maintenance is included in the solution. M/S Birka is always operated and the ship never sleeps, there is always someone or something that is demanding attention, that is why a reliable and smart communication solution is crucial. "Thanks to the dedicated and trouble-free frequency band of the SMART system, you can feel safe. We have installed wireless systems in steel environments before, and it is always both challenging and demanding environment. We are confident that we meet the high demands on reliability and availability on board M/S Birka and all other environments as well. We would like to take the opportunity to thank everyone involved in this amazing project for their great efforts", Sören Erlandsson MD at COBS. ​The SMART1 has very advanced alarm features and a unique top display, which replaces the old fashioned radio pagers used onboard before. On M/S Birka both the fire alarm and the sprinkler system are integrated to the SMART1 system. Thanks to this the staff can receive important messages direct to the palm of their hand, which saves time in critical situations. ”We have cooperated with COBS for many years now and their SMART system was very interesting already from start. We are pleased to have been involved in influencing and contributing to such a successful implementation", says Jörgen Berggren, the Solution Manager at Zenitel. With the SMART1 you can send/receive text messages, chatts, voice calls, e-mails or communicate via the built-in walkie talkie feature "Push to Talk". Make loudspeaking announcements or get video streams from a surveillance camera directly to your phone. Being able to manage several functions from one device improves the workflow and makes the working environment more flexible and safe. ”Innovations of the SMART system led to solutions to the difficulties and challenges we have encountered in the demanding environment on vessels. The security and development of the overall solution was crucial in our choice, says Kenneth Påvall, IT-infrastructure Manager at Rederi AB Eckerö. ​Rederiaktiebolaget Eckerö is the parent company of the Eckerö Group. The Group provides passenger and car ferry services on the Åland Sea in Eckerö Linjen and the Gulf of Finland in Eckerö Line cruises between Stockholm and Mariehamn in Birka Cruises and handles shipments for the export industry between Finland/Sweden and the continent in Eckerö Shipping (former Birka Cargo). Eckerö Group has a total of 5 ships in the fleet. The Group also operates bus services in Åland in Williams Buss. Zenitel is focused on the Secure Communication Systems (SCS) activity that develops and sells our own Intercom and Public Address Systems. We also deliver 2-way Radio Systems and are one of the few companies in our markets that can deliver fully integrated Communication Platforms that include Intercom, Public Address and 2-way Radio Systems.